Undersecretary Rosie Lovely T.. Romulo, Chairperson of the National Council on Disability Affairs (NCDA) led the consultation dialogue with leaders of persons with disabilities held on January 14, 2010 at the NCDA office. The participants represent their respective organizations based in Metro Manila and nearby localities. 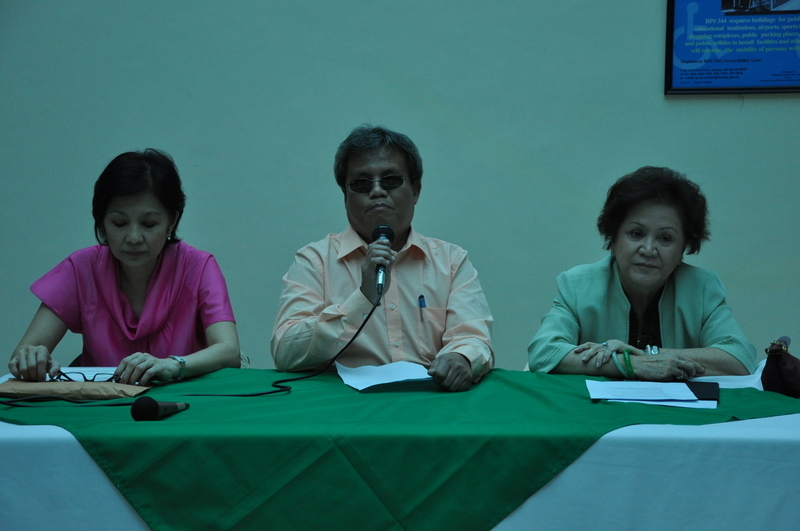 Mrs. Romulo was joined by NCDA Assistant Nora C. Salazar and Mr. Mateo A. Lee, Jr., Officer-in-Charge of the NCDA. 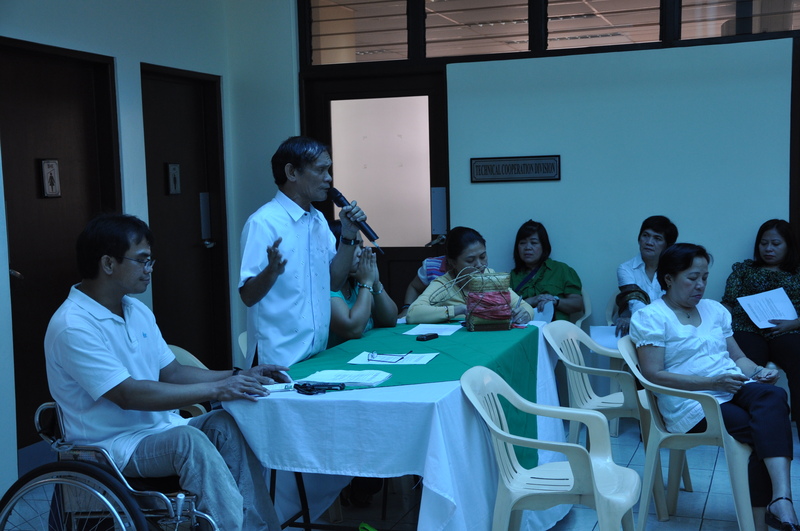 Several issues affecting persons with disabilities were tackled that includes the 20% discount privileges in the purchase of medicines pursuant to the Republic Act 9442, guidelines on the computerization of the issuance of the identification cards providing for the 20% discount, and employment and livelihood programs of persons with disabilities. NCDA shall request the Department of Health (DOH) to exempt from the 20% discount the medicine listed in the coverage of Cheaper Medicine Law for the six months of implementation in 2010. However, all these agreements were referred by NCDA Board to the Legal Consultant for comments since there is a pending case in Court where DSAP is seeking a Temporary Restraining Order (TRO). On the issuance of computerized identification cards, it was disclosed that persons with disabilities can secure the application forms by downloading them from the DOH website for the issuance of ID numbers and generation of statistical report. This will cover NGAs, LGUs, NGOs and organizations of PWDs or any individual whether directly or indirectly involved in the availment of the PWD-ID. This would also undertake data collection of statistics of persons with disabilities. On the issue of employment and livelihood of persons with disabilities, PWDs are encouraged to engage in DOLEâ€™s Kabuhayan Starter Kit (Knowledge-sharing, Inputs acquisition, Training on Entrepreneurship and Skills acquisition) and on the program scheme being undertaken by the Department of Trade and Industry (DTI) dubbed as â€œOne Town One Productâ€ (OTOP). Other discussions include presentation of different programs and projects of leaders with disabilities citing good practices by their local government units that include the cities of Angeles, Mandaluyong, Makati, Valenzuela, and Quezon. Mrs. Romulo acknowledged their presentations and remarks where benefits for persons with disabilities provided by the government are more readily available as a result of the various mandates and policies. Ang inyong ginagawa ay para lamang sa mga lugar na kung saan malapit sa inyong area. Napakaraming mga maykapansanan lalo na dito sa city ng san jose del monte bulacan ang hindi alam ang mga activities na inyong ginagawa para sa mga maykapansanan. ako ay isang lider ng isang samahan dito sa san jose del monte, bulacan pero di ko alam n may mga activities kyo napakatagal ng issuance ng pwd’s id dito kahit na sumusunod kami sa mga requirements. Founding president-boses ng maykapansanan sa pilipinas (bkp) inc. I would like to CONGRATULATE NCDA for a job well done! And I will SALUTE YOU if you will be able to reach out the PWDs in the grassroots level who really needed your assistance and support as they are being left behind in many many ways! The UNCRPD and all the other PWD laws, much more the 20% discounts are very remote to this people. Please do something so that the RIGHTS that are supposed to be theirs will be known and experienced by them.